Achieve your potential every day with Vital Energy from the beehive! 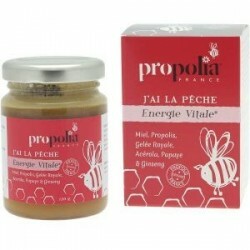 Taken on a daily basis, Energie Vitale® brings you its concentration of Propolis, the hive's natural defender, and a cocktail of Royal Jelly, Honey, Vitamin C and Ginseng, to maintain the sensation of energy and vitality as well as the supporting the immune system. Reveal all your potential thanks to the Energie Vitale* - Vital Energy! Propolia® delivers this alliance of beehive products with vegetable ingredients in an acclaimed formula - a real treasure from the Bee. To accompany you on a daily basis, Energie Vitale® brings you its concentration in Propolis, the hive's natural defender, and a cocktail of Vitamin C and Ginseng, which contributes to maintaining the sensation of energy and vitality as well as the good functioning of the immune system. Stir before use. Take a teaspoon every morning for a month and a half (3 jars).